Also there are lots of 5p off per litre coupon offers within the store, something which I dont think ASDA does. The prices may vary at other stores but I am aware my local stores are the same. never the less this beats ASDA and theyre god dam yanks! £1.26 at my local Sainsburys! and Asda are normally cheaper than them!! OP so how much you saved? good old tesco, every little helps unless there are no others around then FU we charge what we like as there is nowhere else to go! next time i go to tesco i am going to get my own back by not putting my trolley back - so there! Do they? I passed two morrisons at the weekend within 5 miles of each other and they were different prices. I love the supermarket price wars! Might check out Sainsburys next week on the way to work then, cheers guys. wish someone would tell em on the isle of thanet..petrol £1.34.9 diesel £1.40.9 what a bloody rip off. op, are you sure you're not working for tescos marketing team? This thread makes no sense! Local tesco are selling at 134.9p? How is this cheaper than ASDA? 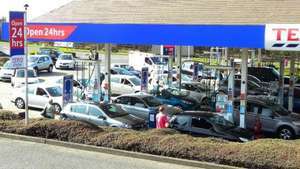 wish someone would tell em on the isle of thanet..petrol £1.34.9 … wish someone would tell em on the isle of thanet..petrol £1.34.9 diesel £1.40.9 what a bloody rip off. @drunk super hero, wycombe is cheaper than reading, just off the roundabout at J4 M40. I'll be there at the weekend hoping that morrisons and esso will push shell's price down a bit. 129.9 at my local Tesco! £134.9 for UL at my local tesco, luckily I commute through an asda and sainsburys town on the way to work. I don't think the price is same nationwide as the nearby tesco in bradley stoke is selling at 136.9 (Diesel). My village garage is cheaper than my nearest Tesco, .......Tesco charge as much as they can get away with. My dad was a tanker driver (now retired) and sub-contracted to Shell and the supermarkets too. He got the same fuel from the same refinery for both. The only difference is if you use something like optimax. If you think standard 95 unleaded or plain diesel is different between supermarkets and 'branded' fuel then you're falling for the myth. Don't think so... My local Asda (Cardiff Pentwyn) is usually 1p/l more expensive than the Cardiff Bay one. My dad was a tanker driver (now retired) and sub-contracted to Shell and … My dad was a tanker driver (now retired) and sub-contracted to Shell and the supermarkets too.He got the same fuel from the same refinery for both.The only difference is if you use something like optimax. If you think standard 95 unleaded or plain diesel is different between supermarkets and 'branded' fuel then you're falling for the myth. Wrong, it was supermarket fuel that caused so many problems for users a few years back, especially Tesco. Good, Asda diesel is crap imo. The car drinks it in half the time I get out of any other fuel. Tesco fuel actually lasts better. Sainsbury's is also good :). Heat added OP! Deal posting newbie! This is Findlay94 first deal post. Help out by leaving a posting tip or just to show your appreciation for their contribution.